QianLi ToolPlus iBridge PCBA Testing Cable can repair the Phone Logic Board. The new iBridge PCBA Testing cable diagnoses the phone's problem, iBridge also enables you to test voltage and resistance with a multimeter. The iphone Motherboard board layout is precise and compact, and most PIN pins have no epitaxial line of testing. For example, the board does not connect to the LCD screen. When the boot board can not detect the screen, there will not be relevant voltage output and technicians can not detect and test the voltage value of the relevant circuit. 4. 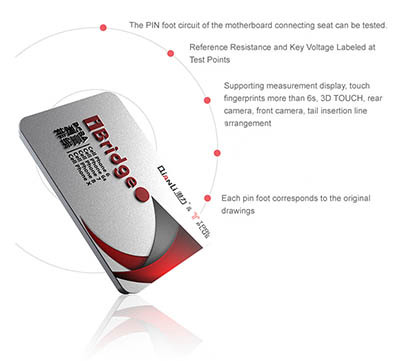 Fingerprint Touch 3D FPC. Connect the connector on one end of the FPC measure cable to the corresponding connector on the phone motherboard, and use the external components or components of the motherboard (such as camera, display, battery, tail plug etc., all of which can be connected to the FPC connector on the motherboard). Then connect to the connector on the other end of the FPC, and print the test pomts of all FPC interfaces in the form of laser printing or ink jet on the FPC, and mark the parameters and pins on the test points.When the failure device is in the power off state, the multimeter can be used to measure the resistance parameter of the test point on the FPC connector. By comparing with the resjstanct parameter of the normal device, the abnormal test point will be found out, and the data of abnormal test point is analyzed to judge the fault coverage.